(800) 515-1342 Best Carpet Repair Louisville KY - Talk To Owner Now! 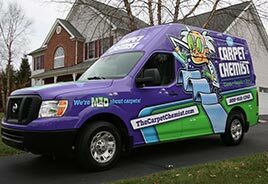 If you live in Louisville, Kentucky you’ve probably seen our big purple and green Carpet Chemist vans in your neighborhood, servicing kind folks just like you in Anchorage, Ballardsville, Simpsonville, LaGrange, Prospect, Indian Hills, Windy Hills, Hurstbourne, Floyds Fork, Crestwood, St. Matthews, Barbourmeade, Peewee Valley, Middletown, Douglas Hills, Lyndon, Goshen, Jeffersontown, Buckner, Fisherville, Shelbyville, Mt. Washington, Brownsboro, Elk Creek, Fern Creek, Persimmon Ridge, Lake Forest, Cherokee Park, Norton Commons, Glen Oaks, Hunting Creek, Finchville, Taylorsville, Eminence, Pleasureville, Campellsburg, Sparta, and Owenton. After 19 years in the carpet cleaning industry, Brandon Cerrito with the help of his trusty sidekick and drop-dead gorgeous wife, Tonya Cerrito set out to fill a void in the marketplace, and hence, The Carpet Chemist was born. This dream team knows carpeting inside and out. Their commitment is to not only being the best carpet repair and cleaning company you’ve ever had, but the best service provider period. Simply put, there’s nothing you can do to your carpet that our team cannot repair, and we want to leave your home with you feeling ecstatic from a job well done, and feeling like you’re part of our family. Carpet Chemist is certified by the Institute of Inspection, Cleaning, and Restoration Certification (IICRC). We are also certified in the industry’s breakthrough Color Cue carpet and rug dyeing system, which is a proprietary technology that takes the guess work out of formulating a perfect color match with our concentrated permanent dyes. This high-performance coloration method puts a new face on carpeting that has “uglied out” over the years. Our industry innovators and customer care specialists provide 100% satisfaction with every service call. While many companies use harsh chemicals, toxic detergents and outdated methods to rejuvenate your home’s flooring, our carpet cleaning, re-dyeing and coloration methods employ gentle, non-toxic ingredients that are easy on flooring and safe for pets and children. To see how effective our professional stretching, repair, dyeing and cleaning methods are, visit our gallery of before and after images. There’s a method to our MADNESS. Serving our customers with professionalism and integrity only enhances the quality workmanship you’ll recieve from the Carpet Chemist. We’re proud to serve communities in and around Cincinnati, Lexington and Louisville. View Carpet Chemist’s service areas. On the blog: Read industry news, find carpet care tips and make your home more beautiful. Why choose Carpet Chemist? Discover the top three reasons. We’re MAD about carpets! We are one of only a few dozen full-time U.S. carpet dyeing specialists—and one of a handful of Certified Dye Masters and Colorists in the entire world! If your carpet is faded, bleached out or in general disrepair from pets, kids and daily traffic, Carpet Chemist can help. During a comprehensive, on-site consultation, we’ll provide upfront estimates for carpet stretching, carpet repair, bleach spill repair, re-dyeing, water damage restoration and more. Call (800) 515-1342 to speak with our coloration and cleaning specialists. To inquire online, click here.